BMW has updated its 7 Series with a new design and luxury features as well as a revised engine line-up. Priced from £69,430, the facelifted model will still be offered in standard and long wheelbase body variants, both of which are now 22mm longer than before, and has been reworked with extensive changes to the interior and exterior, including a new grille. It also features enhanced aerodynamics and increased sound proofing, including new front wings and thicker laminated glass all round. Under the bonnet, the engine line-up now covers petrol and diesel engines using six, eight and 12 cylinders as well as an updated plug-in hybrid offering extended electric range. All engines come as standard with an eight-speed Steptronic transmission – also revised – while xDrive intelligent all-wheel drive comes as standard on the V12 and V8 petrol models and the 740d diesel and is an option for the BMW 730d diesel. The line-up starts with the 265hp 3.0-litre six-cylinder in-line diesel in the 730d, which brings WLTP combined fuel consumption of 41.5-44.1mpg and NEDC Correlated CO2 emissions of 138g/km. There’s also a 320hp 740d xDrive diesel with figures of 38.2-41.5mpg and 148g/km. The entry-level petrol engine comes in the form of the 340hp 740i, bringing fuel consumption figures of between 31.7-34.0mpg and CO2 of 161g/km, while moving up to the 750i xDrive brings an uprated 4.4-litre V8 with an extra 80hp of power to give a total 530hp. Peak torque is up by 100Nm to 750Nm. It returns an official combined fuel consumption of 25.7-26.4mpg with CO2 emissions of 217g/km. At the top of the range is the 585hp 6.6-litre 12-cylinder petrol in the M760Li xDrive, offering a 0-62mph time of 3.8 seconds, combined fuel consumption of 20.8-21.6mpg and CO2 emissions at 282g/km. The range also includes the plug-in hybrid 745e and the BMW 745Le xDrive. These replace the previous 740e and use a 286hp six-cylinder in-line petrol engine from the current BMW Efficient Dynamics family of power units instead of the previous 258hp four-cylinder unit. This is now married up with a more advanced high-voltage battery and a 113hp electric motor, giving a total 394hp of power and up to 600Nm of torque. Official range now stands at 32-36 miles across the standard and Le xDrive models compared to 25-29 (NEDC) for the old 340e and CO2 is 48-52g/km. For the first time, the plug-in hybrid variants are available with the standard of an eight-speed Steptronic Sport transmission, offering even quicker gear changes and the benefit of shift paddles on the steering wheel. All models feature, as standard, adaptive suspension including electronically controlled dampers and two-axle air suspension with automatic self-levelling. Plus, the Driving Experience Control switch can be used to activate a range of damper settings to shift the emphasis of the driving experience further towards either comfort or sportiness. The new BMW 7 Series also features the optional Integral Active Steering system, which brings more relaxed driving and increased stability. Customers can also choose the Executive Drive Pro chassis system – available for all model variants apart from the BMW 745e and BMW 745Le xDrive and standard along with Integral Active Steering on the M760Li xDrive. Onboard equipment includes a hands-free phone system including wireless charging as standard, LED ambient lighting and a rear-seat entertainment system with two 10-inch full-HD displays complete with a Blu-ray player. 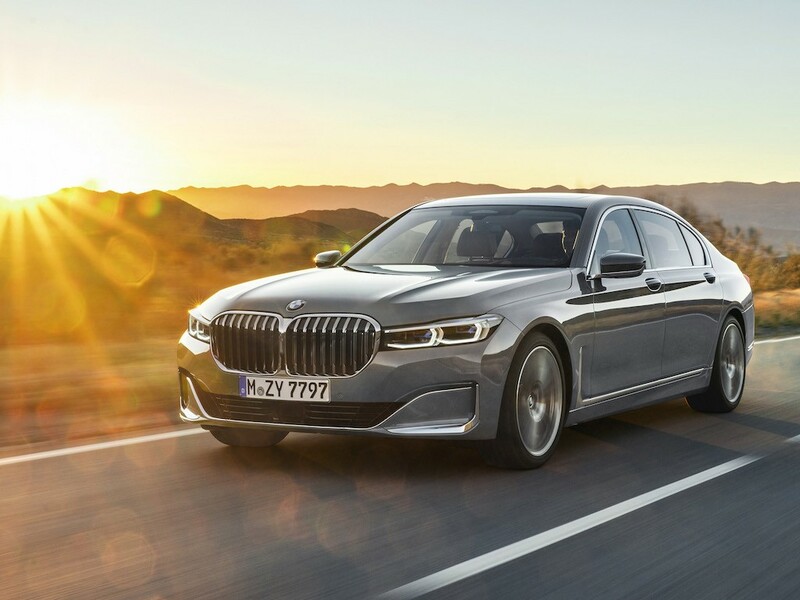 The new BMW 7 Series also includes the latest version of the BMW Touch Command unit, which comprises a removable tablet with a seven-inch screen, which enables occupants to operate functions such as seat adjustment and the infotainment, navigation and communication systems. It’s also been aligned with the software features and functionality of BMW Operating System 7.0, which is also used for the all-digital displays of the instrument cluster and Control Display. Standard specification includes the BMW Intelligent Personal Assistant – an intelligent, digital helper who responds to the prompt ‘Hey BMW’ – along with 18-inch alloys and driver assistance systems such as Parking Assistant Plus, which can be used to help parallel and reverse parking and cruise control with braking function. Options include head-up display, active cruise control and steering and lane control assistance as part of the Driving Assistant Professional package and remote controlled parking. The new BMW 7 Series is on sale from 13 April 2019.